There’s a reason that so many prominent cycle races, including the Amgen Tour of California, take place in Sonoma County: Diversity. From paved rides along former railroad tracks, through vineyard-laden valleys, up and down steep mountain passes, and along knife-edge roads that follow the coastline—and plenty in-between—there are rides here to suit everyone. Here are three itineraries for bicycle rides to suit casual riders and families with children, fairly experienced cyclists with a yen to tour classic wine country, and weekend warriors seeking a true challenge. You’ll also find tips for things to do along the ride. And these three suggestions are just starting point. You can find details about a variety of rides by visiting the Santa Rosa Cycling Club’s website. 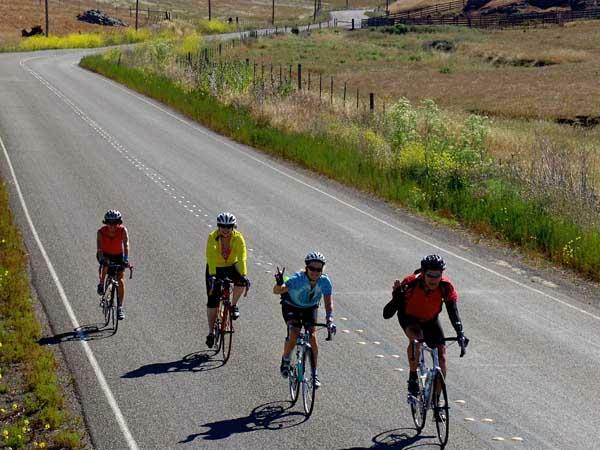 And get more info about bike rentals and organized tours by reading Biking Events in West Sonoma County, Bicyling Sonoma County, and our bike rentals and tours listings. This 5.5-mile trail is suitable for everyone, including families with fledgling cyclists. Built along the route of a former railway line, the trail is flat, paved and exceedingly scenic (gorgeous vineyards, beautiful red barns, rising hills). Most of the trail is also car-free, and you can make interesting stops along the way. The entire loop is 11 miles, but of course you can turn around at any point and return to your starting point. You can also shorten the route by starting in Graton rather than Sebastopol. The trail officially starts near the intersection of Mill Station Road and Highway 116 in Sebastopol (you’ll find parking on Highway 116 and nearby streets—see the Trails Map). The trail is easy to follow and marked all the way. Take a rest stop in the picturesque village of Graton, picking up a snack at Willow Wood Market Cafe, a popular general store/café, or browse galleries and check out the work of local artists. As a definite treat for nature lovers, the Hallberg Butterfly Gardens is a 9-acre non-profit wildlife sanctuary on the southern edge of Graton that provides habitat for dozens of colorful butterfly species. The gardens are only open certain days from April-October, so be sure to make an appointment in advance. Continuing on for a few miles, you’ll come to Forestville. Despite its small size, this tiny town has numerous eateries to tempt your appetite, including the popular coffee shop hangout Tiny Town Cafe & Pastry, wonderful Mediterranean-style dishes at Backyard, and the delicious, imaginative cuisine at Twist Eatery. And you’re bound to love the incredible wood-fired bakery treats at Nightingale Breads. When you’ve had your fill of gustatory delights, turn your bikes around around and peddle slowly back the way you came. For more information: West County Regional Trail.